In this seven week project, we started out with a generic Procter-Silex brand toaster. After taking it apart down to its most simple parts, we examined each component in order to learn about inefficiencies in its design for easy assembly, manufacturing, and overall impact on the environment. In addition, we used this data to determine product and functional requirements in order to redesign the toaster not only for better manufacturing process, but user experience. What followed was a prototype that seeks to remedy all of the problems with the current product, from creation to user experience, to end of product life cycle. Through careful analysis of all these variables and considerations we designed a more modern, compact, wall mounted version of the toaster that has a dropping mechanism as well as a bread slide for easy removal of cooked bread and more intuitive user experience. This project was an exercise in design for manufacturing and sustainability. We began with a standard Procter-Silex brand toaster. Though quite minimal and pleasant to look at from the outside, once we began to take apart this little white plastic toaster, many manufacturing and assembly problems became apparent. This toaster is quite inefficient for its cheap price. It is not designed for easy assembly, which increases the time it takes to put together. Could it be that this product is the work of foreign labor exploitation? In addition to its inefficiency of assembly, the materials in which this toaster is made from are very cheap, and not durable. They may be cost effective, but seem only able to last for about two years. This toaster was made to be thrown away. In this functional requires flowchart, our team analyzed the details of interactions between the user and the product. We condensed these interactions down to their most simple forms: taking untoasted bread, inserting it into the toaster to begin the toasting process, and receiving the toasted bread after it has finished cooking. Simplifying these functional requirements allowed us to gain insight into ways of improving features of the product. One example is the function of bread insertion and dispensing: when we imagine a toaster, the lifting mechanism seems almost essential. However, it is not the lift- ing of bread that is needed. Instead it is simply the transfer of food from the heating element to the user. Understanding this allowed us to think much more creatively of ways in which to improve the product. Does the part move relative to other parts? Must the part be made from a different material? Does the part need to be seperate for manufacture or repair? In our process of disassembling the toaster, we discovered that removing and isolating individu- al components was quite difficult. The disassembly occured on multiple axes (5), requiring us to turn and rotate the product. In the case of manufacturing, this problem makes assembly incred- ibly inefficient, especially when automating. Based on the table above, we calculated that the toaster was comprised of 114 parts. We discovered that 77 of these parts were CFEs, making the part count efficiency ratio to be around 32%. A part count efficiency of 32% indicates that the design of the toaster is very inefficient. There are multiple components that can be removed or redesigned. After the completion of this exercise, it is clear to us that the Proctor Silex Toaster is a product that is manufactured quite inefficiently, and there is much room for improvement. With its part count efficiency of only 32%, the product simply has too many elements. While some components may truly be unnecessary, many components can be merged together, making it a more efficient design for manufacturability. In the case of the metal heating element holders and rear buffer, it may be possible to replace all of it with a metal unibody. they each could simply be replaced with a single piece. In addition, there appears to be too many screws holding the product together. Instead, parts such as the electronics board could snap fit into the outer plastic casing, doing away with the need for screws altogether. Plastic injection molding should make for an easy and an economic fix to many of the aforementioned problems. necessity of the lifting mechanism itself. Does the product need a lifting mechanism in order to toast bread well? If not, then the number of parts needed to manufacture this toaster can be reduced even further by designing a simpler mechanism. In addition to the inherent difficulties in assembling this toaster, foregoing the lifting mechanism may also greatly enhance the user experience, remedying potential pain-points such as the user burning his or her fingers to grab toast. The removal of unnecessary mechanisms and candidates for elimination would both enor- mously simplify the manufacturing process and curtail the costs of the product. Our goal is to improve the user experience and create a minimal, visually pleasing aesthetic to provide greater value to the customer. Our team analyzed the Proctor Silex Toaster along with two of its competitors, Keemo and Hamilton Beach. A variety of customer needs were identified by the team as whole through a collaborative brainstorming exercise. By using reviews on Amazon, we addressed these needs and rated them based on their importance to customers. We examined a variety of factors for the Quality Function Deployment such as the range of inserting and dispensing for the consum- ers of the respective products. Additionally, we evaluated factors such as the size, weight, and durability and their relation to the utility offered to the consumer. By listening to the voice of the customers, we found additional factors that affected the user’s experience such as cleanup and safety concerns. We looked to gain insights about functional requirements from extreme users by thinking about children and school cafeteria workers. As a personal exploration ex- ercise, we attempted to focus on the use of sustainable materials and were driven to explore alternate sources of energy to power the toaster. to change with a rating of 69. To address this concern, we want to design an easy dispensing mechanism instead of the current lifting one. This would remove some components associated with the lifting mechanism like the springs. The Proctor Silex toaster along with the Keemo and Hamilton Beach toaster offers a high lift feature that allows for the toast to be lifted about an inch higher for easier grasping. Equally important, with also a rating of 69, is safety. It would also be prudent to utilize a wooden or heat resistant frame as an added safety feature. This was identified as an opportuni- ty to use sustainable materials as well. Wood’s quality of being a poor conductor of heat can be leveraged for this purpose. The wooden surfaces can be placed near the areas where humans may come in contact with high heat. Another safety factor often overlooked is the temperature of the bread after it is done toast- ing; often times, even after cooking, the toast is still too hot to handle. By creating a better dispensing mechanism like having the toast drop out of the bottom, we would be able to solve both the dispensing and safety issues. Other safety concerns include ensuring that the product does not have any exposed heating elements; this is especially imperative in the case of families; curious children might reach into the slots. In our Proctor Silex toaster, though the front stays quite cool during use, the sides can become quite hot. By contrast, the Keemo Two Slice toaster and the Hamilton Beach Four Slice toaster both have “cool touch” exteriors. A cover that closes the space housing the exposed heating coils could also be implemented. For cleanability we assigned a rating of 64. Through complaints about the various crumb trays on other toasters, we concluded that ultimately, side access to the crumb tray is most user friendly. Of the three toasters, the Proctor Silex model is most difficult to clean; in order to open the crumb tray on the bottom, the user must lift up the product, and flip it completely upside down in order to access it. The Keemo Two Slice toaster and the Hamilton Beach model both have their crumb tray handles open out toward the rear for easy access. The ability to transfer heat to bread received a rating of 40, as it is still crucial to its function so that the toaster can cook the toast quickly and evenly. Despite its problems with consistency of toasting, the Proctor Silex toaster actually cooks quite fast. Also lauded for its speed is the Keemo Two Slice Toaster. However, despite being the most premium product of the three, Hamilton Beach Toaster has customers that complain about its slow rate of heating and lack of consistency in cooking. This may be due to the product’s large size, and additional features. The doneness level adjustment was assigned a rating of 33; the product must have at least five settings with a well designed interface. The most simple toaster is Proctor Silex, with basic function of browning settings ranging from 1 (the lightest) to 7 (the darkest). The Keemo and Hamilton Beach models have the same function, with the addition of features such as bagel mode, cancel, and defrost. However, the Hamilton Beach toaster’s browning settings are designed to be much simpler, with 9 dots and bread icons that show a range between white, brown, and black. Finally, the lowest importance rating of 31 was assigned to the toasters’ ability to consume less energy. We realized this is important for some customers who are looking for ways to save energy due to their environmental or cost concern. We also talked about customers who go camping and who would need a toaster that is off-the-grid. To address some of these concerns, we are exploring the possibility of using the heat generated from the refrigerator’s heat exchanger to power the toast. This way, the heat is gained from the environment rather than generating it. After analyzing the functional requirements and the customer requirements in the House of Quality exercise, our team determined that the top three areas we should work on redesigning were the: 1) Dispensing mechanism, 2) Safety, and 3) Ease of cleaning. Based on this, we deter- mined the three parts that we wanted to redesign. For each of the parts, we discussed the main attributes that the part should have. Then we identified the primary and secondary material options for that part as well as the manufactur- ing process for that material. We then laid out the pros and cons for each of those options to help us identify the most preferred option to incorporate into our costing worksheet to calcu- late the effect of that redesign on the overall cost of the toaster. The biggest challenge that we identified was the need to improve the toast dispensing mechanism as the current method requires putting our hand over and near the heating ele- ments when grabbing the finished toast. The dispensing function is of utmost importance to the user’s experience of this product because ultimately, the act of the toaster delivering food to its user is paramount. However, this function has not always been performed well with previous products. In many cases, the toast is either difficult to reach, or can get stuck in the slots, or may even burn the user. In fact, accord- ing to Reuters, as many as 791 people die every year from bad toaster interactions. the bread inside. Since the slider is spring loaded, the side of the toaster will automatically re- tract once it is released, therefore holding the bread in place. The spring loaded drawer uses four telescoping rods to connect the two sides of the toaster together. The spring loaded rods then pull the sides together holding the bread firmly in place for toasting. The crumb tray is a metal collection sheet that collects crumbs and allows user to dispose of them after use. The customer need is not being addressed because the crumb tray is hard to access, adversely affecting customer experience and reducing the affordance of the feature. Rather than having the crumb tray attached to the body of the toaster, we decided to create a crumb drawer instead that is accessible from the front of the toaster. This allows users to re- move it much more easily and dispose of the crumbs without moving the entire toaster. 100 percent recyclable with no downgrading of its qualities. The re-melting of aluminum re- quires little energy. This method combines metal stamping and injection molding to create the crumb tray. Metal stamping is a cheap and well-known manufacturing processes that has been widely tested. Since we do not need a very complex part, this very simple process is all that is necessary and keeps costs low. The cycle time is less than a second sometimes but at least under a minute. This rapid speed makes this process very efficient for high volume production. Although the tool- ing costs are high, the metal is precisely bent and does not reduce material thickness by that much. 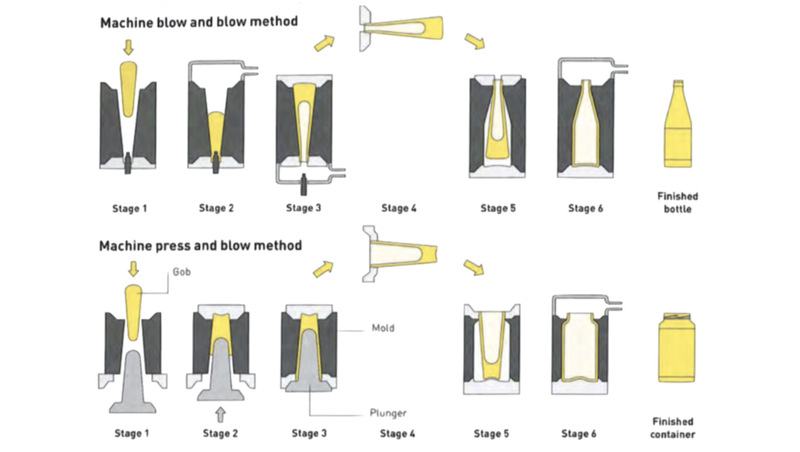 [Textbook p. 82] Injection molding is also a well-known process that is widely used due to its high surface finish and extremely repeatable process. The injection cycle is also very rapid as it takes between 30 to 60 seconds to produce the part. This makes it a very good process for high volume. Injection molding has very low unit costs when many are made, out weighing the expensive tooling costs that depend on the number of cavities [Textbook p. 51]. This method combines metal stamping and anodizing to create the crumb tray. We used metal stamping again since it is a cheap and well known process. For more detailed information, see the above. The anodizing process will be used since it is able to protect aluminum and magne- sium from corrosion whilst affording it a smooth to touch finish. This process builds a natural oxide layer which is self-healing and light. The cost of anodizing metals is not very expensive since tooling is not normally necessary. The process does take a moderate time to finish at about 6 hours [Textbook p. 360]. The clear body will allow the toast to be viewed by the user, letting them visually see how well done the toast is. This is an indicator to show people more clearly, what is happening to their toast allowing the user to know when the toast is ready. Glass blowing has a fast cycle time when mechanized and high quality can be achieved. 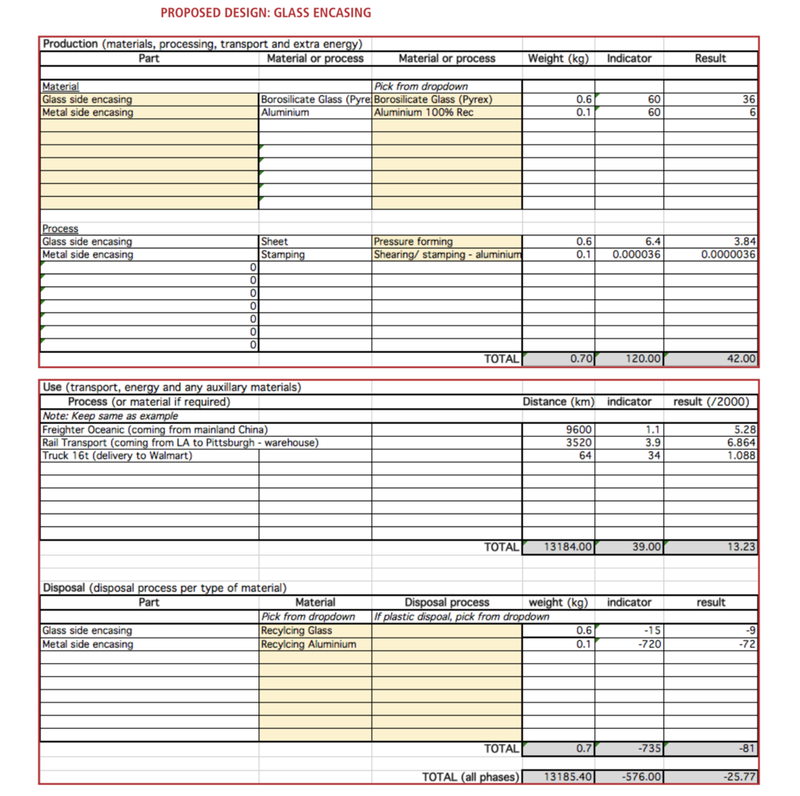 Although the tooling costs are high, the price per unit is much lower for mechanized processes. This is a food safe material process and the final product is produced so that food is able to touch the surface. Abrasive waterjet cutting is an accurate cold cut process which allows material to be cut with- out leaving a heat affected zone where the part would be weaker. A wide range of material thickness can be cut since waterjet cutting is able to cut material from 0.002” to 12” . It can achieve high accuracy of up to +/- 0.001. This manufacturing process allows for flexibility in ma- terial thickness as well as a high precision finished product. Using the QFD template, the new design of our toaster focused on improving the toast dispens- ing mechanism, the cleaning mechanism whilst making it safer to use by accommodating for human error. We decided to split the body of the toaster in two halves, with the two halves of the toaster functioning as a spring loaded drawer to sandwich the bread. The spring loaded drawer uses four stainless steel rods and springs to pull the two sides together. The side faces of the toaster are now made of Pyrex glass with digitally printed heating ele- ments similar to the heating elements used to defrost the rear windshields in cars. The clear glass allows the users to monitor the doneness of the toast while it is being toaster, preventing the burning of toast. The crumb tray is now narrower and slides in and out of the front from the toaster making it easy to clean. The crumb tray being made of aluminum and ABS plastic is now dishwasher safe, improving the user experience. 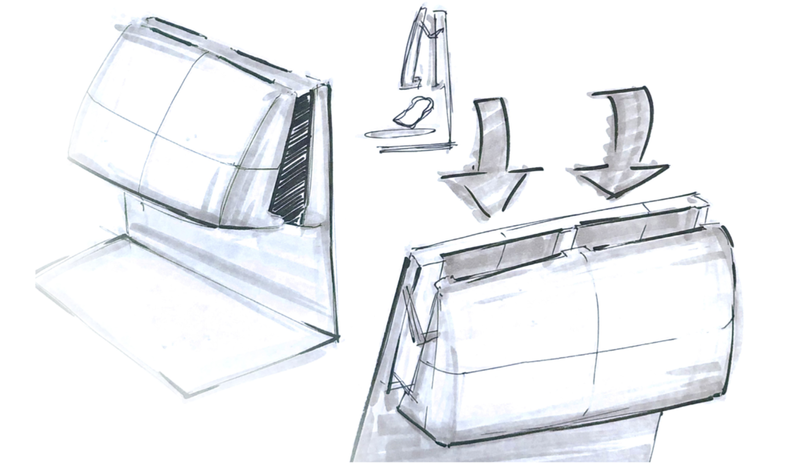 Early ideation was fairly easy once we concluded that the lifting mechanism in a toaster was problematic both from a user experience perspective as well as from a manufacturing perspec- tive. Most of our early iterations involved the idea of having a “drop” mechanism instead of a lifting one. Why use parts and energy to lift the bread when gravity can do the work? In some of these iterations, after deciding on using a dropper, the next question we asked was how would the bread end up sitting in the user’s plate, ready for consumption? Should the toaster drop the bread directly onto the plate? What if the user does not have a plate? From those questions, we came up with the idea of a “bread slide” for the bread to smoothly land after dispensing from the dropper. The toasted bread would stop and rest on the ledge until the user is ready to receive it. This bread slide concept would also solve existing pain points of the crumb tray, namely its difficulty of access and cleaning. This design that resulted was sleek, shiny, and curved. We wished to give our user a product that could feel futuristic, beautiful, and a thing of value. However, problems with this design were that there was no way of opening the toaster easily, and that the entire device became too bulky. In addition, it was not possible to see the progress of cooking; however, glass cannot be curved in this shape. thermostat in which it cooks without an interface, and simply “works” through learning user preferences? Could it use a mobile UI? This kind of integration with internet can extend the life cycle of this product, reducing waste. Improvements and updates can be downloaded, improv- ing the customer relationship. When the product finally degrades, the user’s preferences could even be migrated onto the new product. Last time we examined all our functional requirements and boiled it down to the main three: the product must dispense and deliver toasted bread well, it must be safe, and it must be rela- tively easy to clean. From these three requirements, we concluded that there were 3 parts that needed redesign: the dispensing mechanism, the crumb tray, and the outer casing. Through an iterative process, we simplified these three components in our redesign to become a see-through encasing, a crumb “ledge”, and a bread “slide”. These simplified forms would allow an improved user experience through the elimination of the key pain points associated with the complications of the more complex, previous mechanisms. However, with redesign comes new materials and manufacturing processes tied to new parts. In our proposed design, the outer casing is made from pressure formed borosilicate glass (pyrex) and sheared / stamped aluminum with nichrome heating elements. Additionally, the crumb ledge is made of a combination of ABS plastic and recycled aluminum manufactured through a shearing / stamping process. Finally, the bread slides beneath the toaster when dispensed and the slide is made with ABS plastic. However, after revision for sustainability, we changed bread slide to be made with injec- tion molded high density polyethylene. 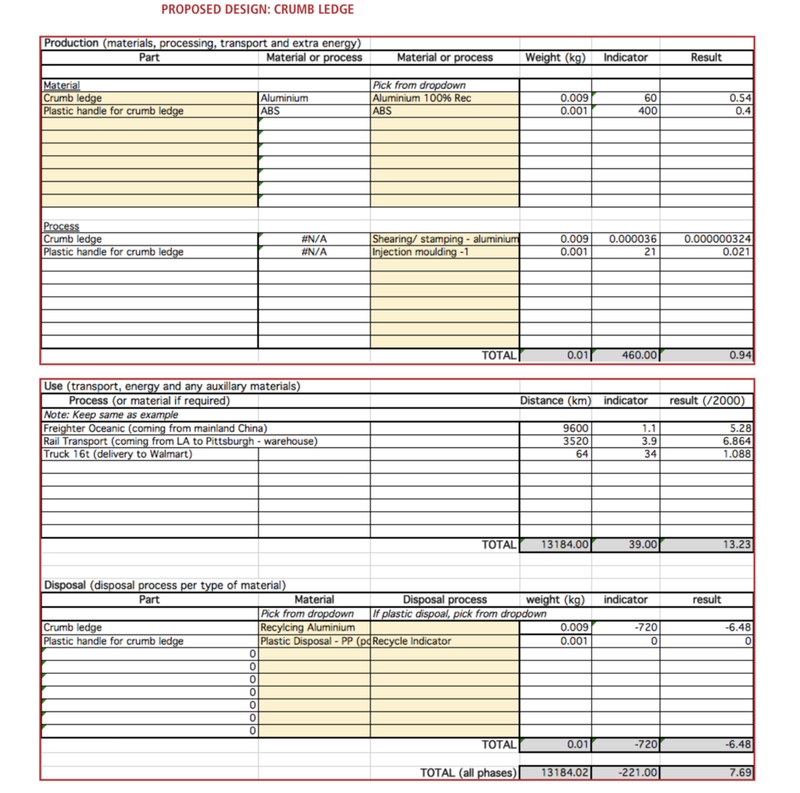 In our life cycle assessment and costing analysis of new parts, we examined not only the materi- als of these parts, but also their manufacturing processes as well as their transportation, use, and eventual disposal method. Though the glass encasing is much heavier than the original proctor silex toaster, the newly designed crumb ledge and bread slide have weights that are nearly negligible. In the original proctor silex toaster, most of the parts seem commonly disposed of in landfills, giving it a total (all phases) indicator value of 1639, making it quite bad for the environment. Both our proposed redesign and eventual revision features materials that are commonly re- cycled, making it a much more sustainable option. In the current design of the proctor silex toaster, the original three parts added together have an indicator and weight result of 90.68 — quite an impact on the environment. In our proposed design, our product has an indicator of -358— meaning our proposed design has 1524% less impact than the original proctor silex toaster. However, with changes we made to our revised proposed design, we had an indicator value of -978, making it 621% even more sustainable than our proposed redesign. Our team had several insights during this project not only about how users interact with a toaster, but ways in which the toaster could be made more cheaply and efficiently with less impact on the environment. We made these improvements, such as the removal of the lifting mechanism, so that we could improve not only the experience, but also the assembly process. In the case of the dropping mechanism, its replacement of the lifting mechanism also meant the exclusion of a spring loaded system, thereby making the device simpler for manufacturing. In addition, the trans- formation of the crumb tray to a bread sliding tray simplifies the structure of the product in removing the need for a door access to the crumb tray. Additional efforts such as concepts for possibilities of integrating internet of things to this de- vice were made to extend the life cycle of the product. 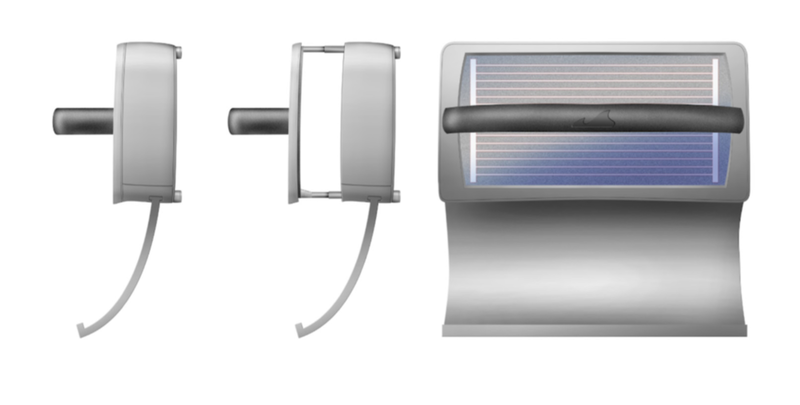 Through careful analysis of the product’s life cycle, we were able to create a toaster that was vastly more sustainable through use of re- cycled materials to create the toaster. However, we have decided that another way to improve the sustainability of the device would also be in its usage by the consumer. Therefore, a device with a longer life, namely, a toaster that could be updated and improved via the internet, could make for a product that would be in use for much longer, reducing the possibility of the cus- tomer throwing the product away and creating more waste. By extending its life cycle, perhaps this product could make a stand against our throwaway culture. Thompson, Rob. Manufacturing Processes for Design Professionals. Thames & Hudson, 2015.